Just to be up front, I am generally a fan of media based mockumentaries, and Aaron McCann and Dominic Pearce's Top Knot Detective is one of the best and funniest examples of the form in a while. The film explores the cult following of the eponymous Japanese samurai TV series from the '70s in the filmmakers native Australia and dives deep into the show's creators, their personal lives, and the cultural force that was Top Knot Detective, a TV program that never existed. The basic premise behind the show within the film mirrors any number of sleazy '70s jidai geki samurai/ronin films and TV shows. A samurai's master meets a violent end and the wronged pupil traverses the countryside looking for revenge and picking up odd jobs or hire along the way. 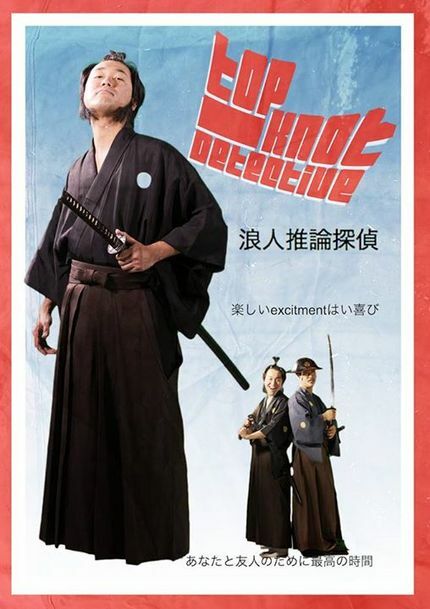 The difference with Top Knot Detective, or Ronin Suiri Tentai as it is known in Japanese, is that things got really weird, really quickly producing what would have been a perfect storm of strangeness, even for a Japanese show. Samurai swordplay drama makes way for funky '70s karoake, pinky violence, tokusatsu special effects based episodes, and eventually a team up with a time traveling baseball player. The result is a wonderful weird mix of stories and elements that feel like that they are so bizarre that they must be true, but they aren't, and I found myself swept up in the journey to the center of this mystery even though I knew it was completely made up. McCann and Pearce make their feature directing debut with a wonderfully bizarre and almost mind-bogglingly complex meta-treatment on not only the delightful weirdness of '70s Japanese cinema, but also the culture of rabid fandom that eats this stuff up. Not only did they direct and shoot hours of episodes of this show that never existed, they did it all in Japanese - and language they do not speak - and in Japan - a country that is not their own. There are occasional talking head pieces from Australian pop culture personalities, but the vast majority of the film is either footage from the show, looking appropriately beat-up since it was only shown on TV and briefly available on VHS according to lore, or interviews with the show's participants. Surely there was an easier first feature they could've made, but we are the benefactors of their determination, and it's funny as hell. When it comes to mockumentaries like these, there are several progenitors that can be pointed to as antecedents, but Top Knot Detective probably hews closest to Peter Jackson's wonderful Forgotten Silver in which Jackson created a world and history so vivid and textured that no matter how implausible it seemed, we wanted to believe. I want to believe Top Knot Detective existed, and if it doesn't, I'm sure as hell glad McCann and Pearce created it, because it's goddamned hysterical.